An item reported that the Dutch steam tug Atlantic of ca. 115 gross register tons, fitted out with 1-400ihp triple expansion steam engine and built for own account by the Scheepsbouwwerven v.h. Gebr. G.&H. 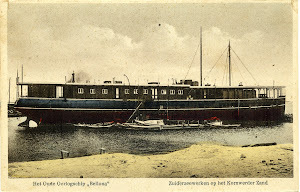 Bodewes, Martenshoek, Netherlands was sold the Shipowners Syndicate, Antwerp, Belgium.